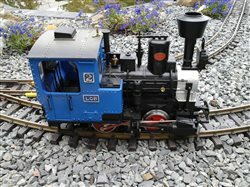 This was the first time I have ever been to a garden railway specific event and I had a great time. I hope to be able to attend a national convention in full in the future. Also Planning the Haymaker Railway garden railway. Start planning for a road trip to Portland Oregon next year! I am looking forward to meeting some fellow modelers. We are vaguely considering at least a partial showing, Hawaiian Air points allowing.